Walter Wilson Johnston was the only child of William Walter and Martha Johnston. 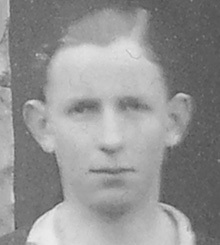 Walter was born on 10th October 1897 in County Monaghan. Walter was an only child. His father was the Station Manager for the Great Northern Railway in Monaghan Town. Walter attended the Model School in Monaghan before transferring to Royal School Dungannon in 1913. Walter then went on to pursue a military career by entering Sandhurst in England on 27 April 1916. After training, in October 1916, he obtained a commission with the 3rd Battalion of the Royal Dublin Fusiliers. 2nd Lieutenant Walter Johnston died on 17th May 1920 from an illness contracted whilst on active service. 2nd Lieutenant Walter Johnston in NOT listed in the CWGC. 5 UK National Archives 2nd Lieutenant Walter Wilson Johnston, Royal Dublin Fusiliers.